I've been burned by Dunkin' Donuts on numerous occasions (check the WhyDIET? archive, it's full of Dunkin' disappointment), which has lowered my near-zero expectations even further, which means there will be a huge upside if they ever manage to serve something worth eating for enjoyment and not just to break the fast. I present to you said huge upside: Pancake Bites. They are the answer to oft asked question*, "Is it okay to have mini-corn dogs for breakfast?" Provided that you dip the shell in maple syrup and replace the cocktail wiener with sausage, the answer is a resounding yes. And much like the donut hole, you can convince yourself that you're taking the healthy high road because, hey, it's just a few bites, not an entire donut/breakfast sandwich. You can further rationalize using the price tag: $1.49 for a sack of 3. 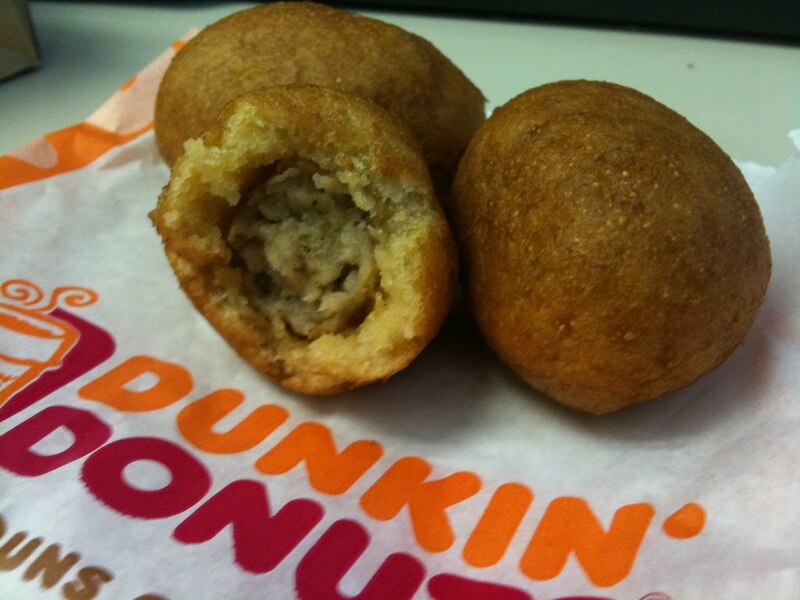 So, dear Dunkin', thanks for not ruining my breakfast this morning. For the rest of you, I highly recommend trying these as soon as possible. Buen provecho.